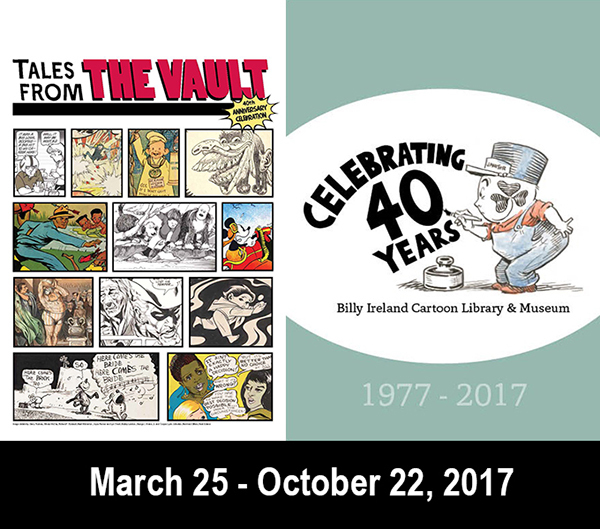 Tales from the Vault: 40 Years, 40 Stories. Billy Ireland Cartoon Museum & Library. March 25 – October 22, 2017. What a challenge it must be to choose between all the remarkable possibilities available for display in a collection as deep as the one at the Billy Ireland! The curators, Jenny Robb and Caitlin McGurk, with assistance from Amy Chalmers, had their work cut out for them. Ideally an anniversary show like this should highlight some gems of the museum’s holdings, introduce the viewer to important collections that form the archive’s backbone, and give the visitor insight into the tales behind all of these intriguing works. The decision to focus on story was a good one, not only because comics are a narrative medium, but also because it’s the very human stories behind these works that give them continued resonance. In these trying times, it’s a positive thing to see stories of people overcoming other obstacles in history, such as the Depression, the fight for civil and women’s rights, corruption in politics, and other issues. As expected, the show includes some of the superstars of comic art; Hogarth, Outcault, McCay, Caniff, Foster, Kurtzman, Spiegelman, and Watterson, among many others. I was more impressed that the exhibition showed a good balance of pieces by, about, and for women, a challenge in an industry professionally dominated by men for decades. One piece on display, the Ball Point Bathing Suit, addresses this topic directly. In January of 1950, female models posed in white one piece bathing suits at a glittering New York cocktail party that was part promotional event and part fashion show. Several famous members of the National Cartoonist Society were invited to “test” a new type of waterproof ballpoint pen by drawing on the bathing suits worn by the models. 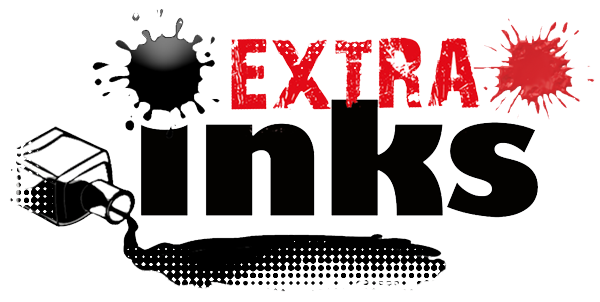 After artists like Ernie Bushmiller (Nancy), Milton Caniff (Terry and the Pirates and Steve Canyon), Alfred Andriola (Kerry Drake), Otto Soglow (The Little King), Ham Fisher (Joe Palooka), and other male comics luminaries drew their famous characters on the suits, the models were doused with water from watering cans to show that the ink wouldn’t run. Events of this type were not unusual in this era. The NCS itself was conflicted about the role of women in the comics industry and were actively arguing a petition for the admission of women members brought by cartoonist Hilda Terry in November, 1949 (after months of sometimes vicious argument, the NCS would finally agree to admit women members in July, 1950). On display was one of the five bathing suits from this event held by the Billy Ireland and a photo of the event taken by Bernard Hoffman for LIFEmagazine. Hoffman’s photos of the event were ultimately deemed as inappropriate for a family magazine by LIFE‘s editors, and they remained unpublished. A much earlier example of the uphill cultural battle women faced can be found in a 1790 cartoon poking fun at the esteemed British astronomer Caroline Herschel, which is included in The Hale Scrapbook, a collection of rare British cartoons, engravings, letters, and clippings dating from around 1746 to 1830 (creator unknown). Born in 1750, Caroline became interested in astronomy while assisting her brother, William, who discovered the planet Uranus and was George III’s court astronomer. She independently discovered 8 comets, including two in 1790, the year this cartoon was published. The cartoon depicts a cupid, as a heavenly body, farting down at Caroline as she gazes up at it through her telescope. The cartoonist may have been ridiculing her for stepping outside of the gender roles of the era. Despite this criticism, Caroline persisted, becoming the first woman to be paid for her work in the sciences and the recipient of the Gold Medal of the Royal Astronomical Society in 1826. The scrapbook display also contained a description of the Herculean effort made to restore and preserve this one of a kind artifact. Many other comics by and for women were included in the exhibition: a selection of comics by the underground cartoonist Aline Kominsky-Crumb, pro-life and pro-choice comic books published while the Supreme Court was deliberating Roe v. Wade in 1973, and comic strips by women entrepreneurs Grace Drayton (Campbell’s Soup Kids, 1915) and Rose O’Neill (Kewpies, 1935). It is through the obsession of one individual collector that we are able to study popular artists of long ago eras like Drayton and O’Neill in the newspapers as they were originally published. Over a period of 30 years, thousands of bound volumes and clippings of daily comics pages were collected and preserved by the author and collector Bill Blackbeard, founder of the San Francisco Academy of Comic Art. When Blackbeard discovered in the 1960’s that libraries were discarding their collections of newspapers in favor of microfilm, he traveled the country collecting them to save them from destruction. In the exhibit display, there were photos of Blackbeard dwarfed by towering stacks of these bound volumes. By 1997, when he lost the lease to the home where he was storing this archive, he had amassed over 2.5 million comic strips and clippings. The BICML worked with Blackbeard to move his collection to Columbus, Ohio, transporting 75 tons of newsprint in six semi trucks. Blackbeard’s preservation of these printed comics has been an important resource for researchers studying the history of comics. Both of these cartoons based their underlying message on classic works that people in that era would have recognized. Gillam’s Phrye before the Chicago Tribunal refers to Jean-Léon Gérôme’s painting of the legendary beauty Phryne, a courtesan who was supposedly acquitted at a trial after her defender exposed her naked body to the jurors to gain their sympathy. McDougall’s The Royal Feast of Belshazzar Blaine and the Money Kings borrows the Biblical story of King Belshazzar, who held a great feast where his lords drank from vessels looted from Solomon’s Temple. Strange writing from God appeared on the wall, foretelling his doom. In the end, Blaine lost the election, and blamed these cartoon campaigns for branding him in the public mind as greedy and corrupt. This is just a sample of the tales told in this rich and fascinating show. The stories the curators chose to tell in this exhibit were intriguing and left the viewer curious to know what other possibilities lurk in the depth of the Billy Ireland Cartoon Library & Museum’s collection, setting the stage for the 50th anniversary exhibit a short ten years from now. Kim Munson is an author and art historian based in San Francisco writing on comics in museums and on contemporary works on paper. See her books at neuroticraven.com.